Beachwear has long ceased to be the prerogative of only one summer. Since then, as our compatriots had the opportunity to go to hot countries and in the winter, you should always have ready the so-called «beach» suitcase, which would include all of the latest trends of clothing, footwear and accessories for sea travel. It will relieve you of need to think what to wear to the beach during fast collecting for the seaside. In 2016, still in the direction of the current beach fashion for the lovely ladies is tenderness and femininity. Light developing the wind silhouette made of delicate silk tunics, spacious beach pants, wide-brimmed hat, sunglasses with large lenses — all this was a place in the beach fashion in 2016. And now everything in detail. If last season the crest of the fashion wave climbed airy tunics neon colors, then in 2016 their number will press more gentle tone, creating a romantic mood. A spectacular discovery designers — smooth transitions from one color to another, the effect on Ombre tunics. Classics of all beach outfits ideas is a contrasting black and white tunics. These models also do not lose their relevance in the beach fashion in 2016. Knitted tunic Beach maintains its position for several consecutive seasons. The degree of openwork can be different — from tight knit up a large seductive. What to wear to the beach, if you want shorts or pants? Find on the beach girl, who came here in leggings or jeans — not an easy task. This is understandable, because the hot weather means light pants — for example, a model made of lightweight silk, rayon, or a very thin knitted lace. Whatever material you choose, almost all beach pants 2016 from a spacious silhouette, low waistline and straight cut. As for color, then your imagination should not deter anything other than their own preferences and basic sense of style. Shorts on the beach is always relevant. They are good because they can, not changing clothes, go to the beach for a walk — because such clothing is very fit harmoniously into the landscape of the resort. In 2016, the relevant sports models will, waisted shorts, colorful fluttering skirts, shorts and denim counterparts. Femininity is always in fashion. 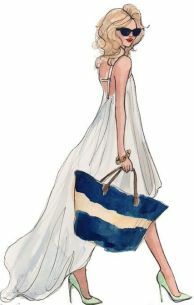 Look stunning, going to the beach — it does not mean to put all its charms on display. Especially if you plan to after sunbathing and swimming stroll along the waterfront. In this case, handy beach dress — it will allow time to cover the body from the sun, as well as add to your image of the sea touch feminine and sophisticated charm. If you’re looking for what to wear on beach, pay attention to the eternal classics — spacious sundresses-bandeau, as well as light-maxi dresses of flowing matter. Such models are relevant for several seasons in a row, so getting a similar dress in 2016, you can assume that you are making a profitable investment in your own beach image for the future. For more sporty girls created simple beach outfits, which you can choose of army of dresses, shirts and long shirts. In conjunction with slates flat shoes, a hat or a baseball cap and sunglasses aviator any of these models will look like with a bang! Beach fashion cannot exist without hats — of course, if you do not want to make a sunstroke. It offers a full arsenal of models — shawls and scarves, bandanas, wide-brimmed hats, felt hats, caps, baseball caps. The beach season in 2016 will enjoy special popularity feminine headgear — in particular, handkerchiefs and hats. They give us the opportunity to feel like a real woman. Absence of a bag turns a beach vacation into a disaster — well, where, in fact, put a rug, suntan, notebook, phone, wallet and other important stuff? So fashionable beach bag 2016 is simply obliged to be roomy, solid and have comfortable handles. However, too far, too, should not — take a huge sack is not necessary. Attractive motif 2016 — floral patterns. Also fashionable are knitted and woven bags of straw. Thinking what to wear at the beach this summer, remember — to forget about your natural attraction on vacation is unforgivable. Dark green beach dress with lavender swimsuit is an opportunity to be gentle, romantic and irresistible in any hot country, at any seaside. White chiffon bohoo coverup. Romantic and cute image. What to Wear with Black and White Striped Pants? 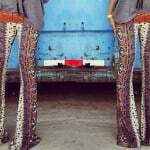 What are Bell Bottoms and How to Wear It?